New Eden Valley entrepreneur Ambria Schmitt serves up a lifted tea to Hailey Johnson at the Eden Valley Community Center, her temporary location for EleVate Nutrition now open Mondays and Fridays, from 11 a.m. to 4 p.m.
EleVate Nutrition, a satellite nutrition club serving nutritional flavored aloe, teas and shakes, is now open in Eden Valley at the Eden Valley Community Center. Last summer, Ambria Schmitt walked into her first nutrition club. 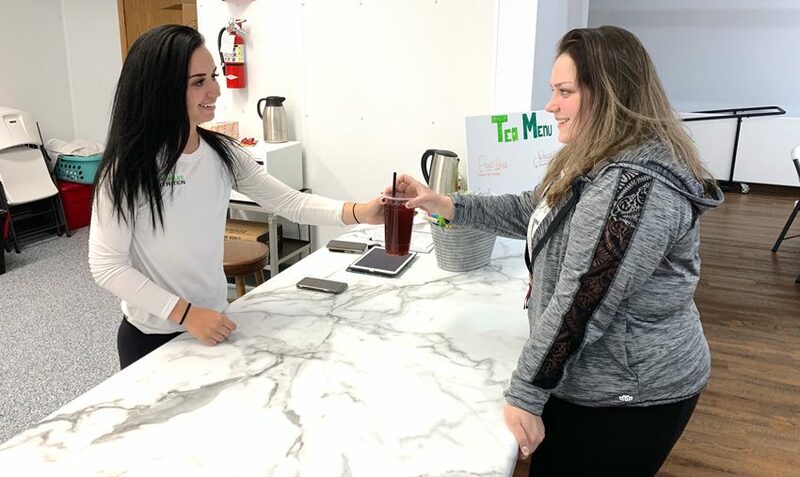 After trying her first aloe, tea and shake at Crave Nutrition in Cold Spring, she decided to purchase the products to make her shakes at home. Watkins graduate embarking into entrepreneurship with a drive to create a healthier community. Shortly after Schmitt began her journey of health and wellness, she noticed that she had more energy, had lost 21 pounds, and gained 6 pounds of muscle. She decided that she wanted to help others reach their own health goals and chose to become a wellness coach. “I have become pretty serious about health and wellness. It’s something I’m very passionate about and I wanted to be able to bring that to the Eden Valley community,” said Schmitt. Vienna Hansen, the co-owner of Crave Nutrition, encouraged Schmitt to follow her heart and open her own nutrition club. 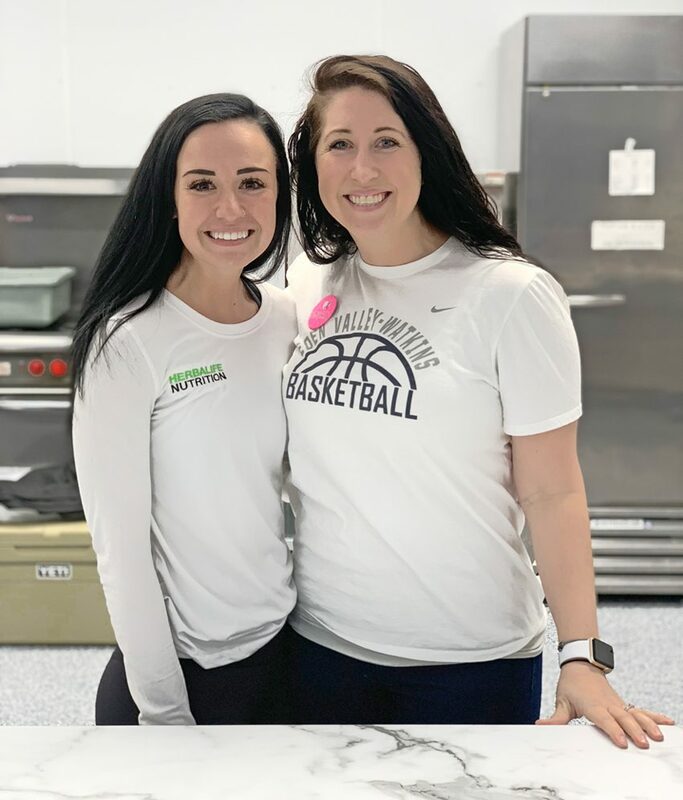 Schmitt has been training for the past nine months out of Crave Nutrition with Hansen, her business mentor, learning the ins and outs of wellness coaching as well as what it takes to operate a nutrition club. “After months of seeing the residents of Eden Valley commuting to the Cold Spring area for the services, I could see that there was a definite demand for a nutrition club [there],” said Hansen. This is where the opportunity of opening a satellite club fell into place. A satellite nutrition club is a “pop-up” nutrition club that is set up with the purpose of being a temporary location. Basically, it’s a mini version of the traditional nutrition club and is designed to serve nutritional aloe, teas and shakes. “Being able to provide a healthy alternative to the community, from a healthy food-fast standpoint. Health and wellness is such a growing need, and I hope to bring that to Eden Valley,” said Schmitt. The shakes that Schmitt serves at EleVate Nutrition contain 24 g of protein, 240 or fewer calories, and can serve as a meal replacement or a healthy snack. Teas, known as lifted teas, boost your energy and metabolism. The teas are a combination of green, black, and orange teas with an added boost from vitamin B12. When ordering at EleVate Nutrition, its like getting a healthy version of a “burger, fries and a soda.” A customer who orders both a shake and tea will also receive a shot of flavored aloe, which helps soothe the digestive system. Community Center on Mondays and Fridays from 11 a.m. to 4 p.m. A permanent location will be announced at a later date. “My future plan is to open a permanent location in the Eden Valley area. I am scoping out places as we speak. I hope to be able to help as many people possible with their health and wellness goals, as well as continuing my personal goals,” said Schmitt. Ambria Schmitt and Vienna Hansen pose on Schmitt’s opening day in the Eden Valley Community Center. Photos courtesy of Laurie Kohnen.